Inner Wheel District 24 – "Women working together, making a difference and improving lives." On January 10th to celebrate World Inner Wheel Day and emphasising friendship we had a lunch for members and guests at Little Channels with a speaker, Warren Ashton, whose talk was entitled “Metaphors, clichés and phrases – avoid them like the plague”. We had an entertaining afternoon and learned a lot about the origin of many expressions we use in everyday conversation. It was a great way to celebrate all that Inner Wheel represents. We are looking forward to our next social lunch in April when we will have milliner, Pam McCarthy, telling us about her work and showing us how to wear hats and fascinators correctly. Sunday 19th May 2019 from 2p.m. to 5 p.m.
Speaker, Frank Franklin from charity, Toilet Twinning. Tickets £3 each. Raffle, quizzes, lots of chatter. ome adfind out ideas for fund raising for Toilet Twinning. Bring your own indoor picnic, Prosecco too if you wish! Have an afternoon of relaxation, fun, get to know ladies from other clubs and re-acquaint yourself with old friends and swap ideas. Bring club members and any ladies you want to introduce to your club. 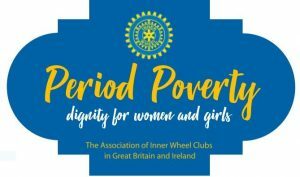 The Period Poverty initiative is to be launched in the House of Lords on 7th March, further details can be found on the Association of Inner Wheel’s website www.innerwheel.co.uk. There are currently sixteen Inner Wheel Clubs in District 24. Click to find details of the individual Clubs. Click to find out about the roles of the District Committee and contact details for Chairman Gill Swanson and other District 24 Officers. District Chairman Gill's charity is Hearing Dogs for Deaf People As part of her fundraising for the charity, Gill has commissioned calendars consisting of photos of members' dogs, which are currently being sold to raise funds for the charity. District International Service Sandie's charity is Toilet Twinning. Inner Wheel Clubs welcome new members, please click here for more information.